Not an individual member yet? NOTE: If you are already working for an Operator or an Contractor company then please contact your HSElife Focal Point to receive your login information. You can find the list of HSElife Focal Points here. Speaking the same clear language regarding HSE. That’s the goal the member parties of HSElife NL pursue. Every quarter we take a closer look at issues related to HSE. We wish to ensure that anyone working in the Oil and Gas industry increases his knowledge of HSE. A digital library of harmonized HSE documents you can use in the preparation for your work, for example during the toolbox meeting and during work. In the library you’ll find A6 brochures, onscreen presentations (including five knowledge questions) and videos. On this page you’ll find several mandatory interactive training videos and refresher videos. By following the refreshers you keep your knowledge level up to date. Here you’ll find HSE programs you can use in your organization and digital documents to communicate about HSElife NL. 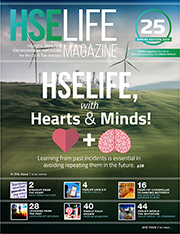 Another important means of communication is the HSElife magazine. This magazine is an important contribution to the development of harmonization. Here you read exactly what is said about the Oil and Gas Industry. Each quarter, we inform you about the latest activities and developments of HSElife NL. You can also use this information within your organization. In this way you contribute to the harmonization and we communicate directly with the man/woman on the shop floor. The ordering list can be downloaded here. Through this video channel we will present you everything you want to know about working safely in the Oil & Gas industry. The latest edition is here A free online magazine (e-zine). 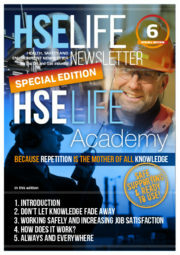 An important means of communication for HSElife NL to share HSE information with the entire industry. WHERE CAN I FIND WHAT? Are you looking for a specific item, a training or refresher, a video or the latest edition of the newsletter? The sitemap shows a list of all pages and components and the direct link to it. By clicking on the logos below you can watch our short promotional videos. The videos will open in separate window. To go back to this page, just close the video window. The HSElife Academy helps the men and women on the shop floor to keep the level of safety knowledge, both Onshore and Offshore as well as Office. It’s a perfect way to reduce the risk of incidents. HSElife Learning and Registration System (LARS) is an online training registration system in which the training results are registered. Accessible on any device, anytime, anyplace. Insight into employee qualifications. Employability scheme always at hand. Possibility to take any training program at any moment. HSElife is a proud winner of “Safety Coalition of the Year 2018 Award” and we are also very proud of all our Coalition partners for this amazing achievement. To see which Operators, Contractors and Supporting Organisations participate in this harmonisation initiative please click on the respective links below.